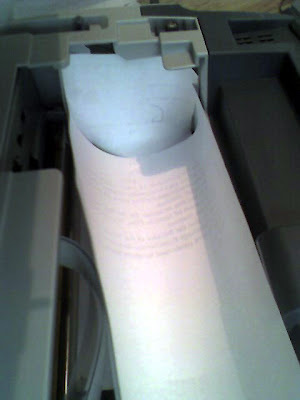 Following the directions below I was able to get my printer working again. I have a bulk ink system installed and when I first encountered this problem it ended up costing me over $40 to have them do what I presume was the same thing. 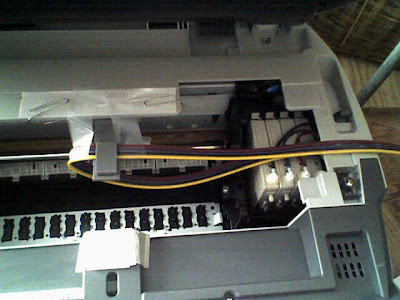 There is no indication that there is any real threat of ink spilling out of the printer due to overflow from head cleaning, so I have not attempted to further modify the printer. 8. turn it on again." The photo above shows the printer cartridges in place and my finger pointing to the modified bit. 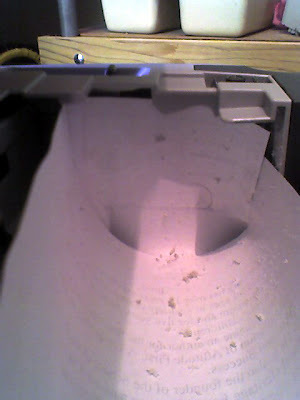 The next two photos show the bit before and after it was modified and shows how I put paper in the printer to contain the shavings from the dremel cutter. Finally, here is a photo of the bulk system in place. I added some extra support to the plastic piece that was provided to attach the tubing. I had to increase to thickness of the piece that was meant to stick it to the underside of the case and then added paper clips to ensure that it did not come off easily. 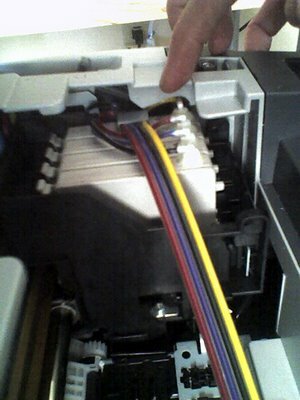 The scotch tape helps keep the tubing from catching on the ink cartridge carrriage.